One problem I have sometimes is wheelhop when launching. It's not like I'm at a drag strip, either; just pulling out onto a busy street can yield horrible wheel hop if I'm not careful with the clutch and gas. I believe the rubber motor mounts have become worn out with age; visual inspection during my timing belt change showed the front left lower mount to be severely cracked. Two methods available to reduce wheel hop are stiffer motor mounts and radius arm traction systems. 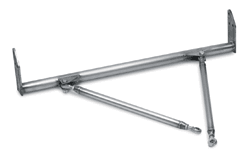 Radius arms systems consist of a crossmember and two rods which attach to the front suspension's lower control arms. 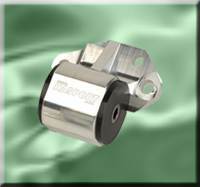 They reduce or prevent wheel hop by preloading the front suspension, preventing the caster from changing when launching. There are currently at least six such systems available for the Integra; all of them attach to the factory towhook locations in front, but some differ in where along this crossmember the radius arms are mounted. The six systems I know of are from JimFab.com, Full-Race Motorsports, L-Con, Competition Engineering, Z10 Engineering, and Lakewood Industries. 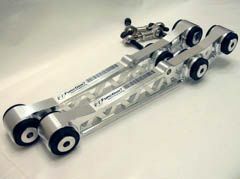 The Z10 bars, while seriously overpriced at $675 for the chrome-moly version, are popular and advertise that they can be used on the street, with no suspension binding. However I seriously doubt this claim. After reading some posts on Honda-Tech by the original designer of Z10's radius arm system, with a detailed description of why both the CE and Z10 bars have flawed designs, I have to agree assuming the given information is correct. Basically, the theory is that the front suspension's lower control arm rotates around a fixed axis (which can be seen by the two locations it mounts to the body at). A radius arm attached to this control arm, in order to avoid binding, must also mount to the chassis along this axis. Some trigonometric analysis shows why this is true: I don't have any diagrams to show, but I'll leave it as an exercise to you to use your high school math skills to confirm my results if you wish. In summary, if the radius arm mounts to a point on the chassis closer to the outside of the car (as in the Competition Engineering system), the radius arm will be placed under tension as the suspension compresses. If it mounts to a point closer to the centerline of the car (as in the Z10 system), the radius arm will be placed in compression as the suspension compresses. Either way is undesirable since the suspension's travel will be limited, though the Z10 will have less of an effect since its arms are longer and thus will allow more travel before the binding becomes noticeable. This all seems pretty pathetic if you ask me, since it only took me about 10 minutes to do all the calculations for myself, and I'm not even a mechanical engineer (and haven't done much real math since graduating college 5 years ago! ); in fact, I was able to figure this out with high school level math. Another method of reducing wheel hop is to replace the worn-out rubber motor mounts with new polyurethane mounts, or to add urethane motor mount inserts. 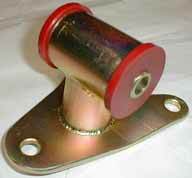 Energy Suspension and Prothane both offer urethane motor mount inserts, which basically fill in the voids in the stock rubber mounts. This seems a little ghetto to me, and also might not be optimal if your stock mounts are worn out, but this is the most inexpensive option. 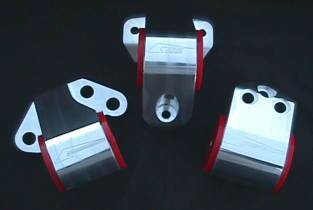 Several companies offer motor mounts which completely replace the stock ones. This seems like a better route to me from a quality and durability perspective, but it costs a lot more. The companies I've found which offer mounts for the Integra are HASport, AZ Race and Machine, Place Racing,and JimFab.com. Obviously some of these mounts look nicer than others, but of course it comes at a price. 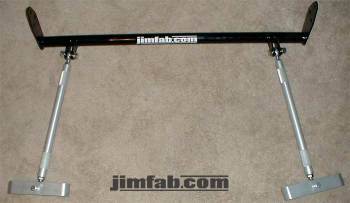 The HASport mounts, for instance, cost a whopping $150 each, while the JimFab side mounts cost $85 for a pair. One last method which is far less expensive than any of the previous methods is to cut out the rubber in the factory motor mounts, then fill in the space with liquid urethane, found in caulking tubes at hardware stores. My biggest concern with any of these options is engine vibration being transferred to the cabin. 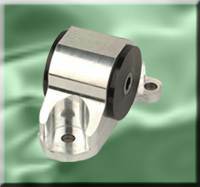 OEM mounts are designed to be relatively soft so that the cabin doesn't vibrate. But of course, they also seem to have a longevity problem, and allow a lot of wheelhop. Performance mounts (or inserts) should help significantly with these problems, but I also don't want my car vibrating a lot because of it. These Function7 rear lower control arms are machined from aluminum, and weigh less than 2 lbs. apiece. They look rather nice too. If these don't seem to be enough of an improvement over the stock arms (which weigh around 6 lbs. each), Function7 has plans to introduce replacement front control arms as well. The cast iron front arms weigh around 25 lbs. each! So there's a lot of room for improvement there. Since this weight, being in suspension arms, is partially unsprung, lessening it has a much greater impact on ride and handling than removing weight from other (sprung) parts of the car. At some point (maybe after I reach 200,000 miles), I'd like to upgrade to a newer engine. 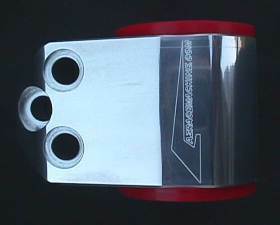 I have my eye on the K-series engines used in the RSX, TSX, and several other Honda models. 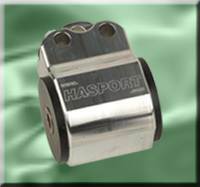 There are several companies with parts for installing a K-series engine in a DC chassis, including HASport and Karcepts.